A chiminea, also spelt chimenea, is a garden product that allows you to create warmth for your garden or patio from a contained fire. They work as a great, traditional heat source as well as being aesthetically pleasing. Chimineas give you the ability to use your garden furniture longer in to the night as the summer draws to a close as well as being able to sit outside in the colder months of the year and with certain styled chimineas they give you the ability to cook food. What types of chiminea are available? ० Sand Cast Iron Chiminea - This is the strongest and most robust chiminea, the reason that sand-cast chimineas are stronger and much more robust is that sand casting produces a product that is 6mm thick making it extremely heavy, a sure sign of quality as well as giving better insulation. This means less heat is lost through the walls of the product and the chiminea has an extended lifespan. ० Steel Chiminea - Steel chimineas have become more popular in recent years due to their contemporary designs and modern feel. ० Clay Chiminea - Clay chimineas are the traditionally styled products that have been used in gardens for over 35 years. Clay chimineas originate from Mexico, where they are crafted by hand from terracotta clay for a truly authentic touch. How do I light my chiminea? ० Use a flame to ignite your fuel, we recommend ocote firelighting sticks, they light very quickly and will help to spread the flame to the fuel. Once you have lit the ocote stick, place it into the bowl of the chiminea where it will light the fuel you have chosen. ० Clay is fragile and you must layer the bottom of the bowl with 50mm of sand and/or lava stone so that it is not exposed to direct heat. ० Clay chimineas in which you should only use dry wood or specialised chiminea fuel. ० Break in your clay chiminea over time, start by burning small amounts and gradually increase the amount of fuel burnt; if you try to burn too much fuel to soon then the clay will crack so it is important that these basic rules are followed to avoid this happening. Can I leave my chiminea out all of the time? Cast iron and steel chimineas will rust if not protected, Clay chimineas can and will crack because of temperature changes. Most people that own a chiminea store it indoors or in water tight location during the winter months. We would strongly recommend using a waterproof chiminea cover to protect your chiminea from the elements. If you have a clay chiminea then you should seal it twice a year, We recommend Chimseal to give it an extra layer of protection from the elements whilst not in use. 1. Light your Chiminea as per our lighting instructions. When cooking on your Chiminea we recommend burning charcoal or briquettes. Where should I place my chiminea? Your chiminea should always be placed outside so that any smoke given off from the fire can escape, never should a chiminea be lit indoors,within a enclosed space or under a shelter or awning. Depending on what type of fuel is used, and how much fuel is placed in the chiminea bowl it can mean that flames roar/spit out of the top of the flue. We strongly recommend that the chiminea is also not placed too close to anything that will easily burn or melt, for example garden furniture is traditionally made out of wood, textiline or resin (rattan furniture). If you wish to place the chiminea on to anything other than a concrete base then we strongly advise placing a paving slab(s) underneath and around the area so that the surface is not damaged. Placing the chiminea directly on to grass can cause the it to die or burn, again we advise that you lay a surface of paving slab(s) underneath the chiminea and it's surroundings. The size of the chiminea will influence how much heat is given off, if you have a very large chiminea then it would be better to place it further away from the area that you are sitting so that you are not overwhelmed by the amount of heat that is produced. Once you have placed your chiminea in the position that suits you best it is ready for use. Please note, you should never try and move your chiminea whilst it is lit, it is unsafe with the lit fuel inside and the handles can become extremely hot. Will my chiminea crack and should I seal it? If the recommendations are followed then your chiminea should not crack. Cast iron and steel chimineas will not crack unless they are dropped or damaged, clay chimineas can crack because of heat change so you should never extinguish the fire with water as this can crack your chiminea as the clay material will experience dramatic heat change we call "Thermal Shock". Clay chimineas can also crack if they are left exposed in the winter months, we recommend that you use a waterproof cover during the cooler months of the year. In addition to covering your chiminea, we recommend Chimseal to be used with all clay chimineas. Chimseal is a protective coating for your clay chiminea, and it should be applied to your clay chiminea twice a year, once at the start of the summer season and once at the start of the winter season. This will provide a layer of protection over the clay surface so that when the temperature changes across this time, the clay will be less likely to crack. Can I cook on my chiminea? Yes. You can cook on your chiminea, some chimineas come with a grill that you can place food on to heat, some have removeable flues and additional grill surfaces to cook on as well. We also offer a hand-held grill that you can place food on to and insert directly into the chiminea bowl. How much of an area will my chiminea heat? This all depends on the size of the chiminea, the fuel that is burnt and the material that the chiminea is made out of. The larger your chiminea, the more fuel you can burn inside, therefore more heat will be created allowing you to heat a larger area. 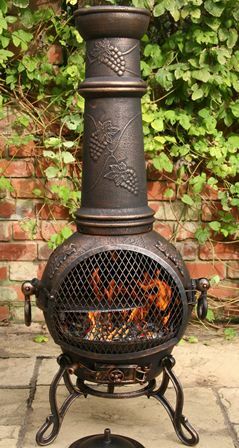 As an example the chiminea that gives off the most heat would be our "Chaos" Sand-cast iron chiminea from the Firefox range. Does the height include the stand/legs? How do I put my chiminea fire out? The best way to extinguish your fire is to let it burn out the remaining fuel left in the bowl. The fire is contained, however we do not recommend you leave it unattended especially whilst fully lit. If your chiminea has an airvent then if you close it, this will reduce the size of the flames so they can die out. Do not ever extinguish your chiminea flame with water as this can inflict Thermal Shock on your chiminea which will cause damage. Spread any remaining fuel around the bowl so that the heat source decreases. This will help the fire burn out quicker. Once extinguished the chiminea may smoke for a while afterwards. Do not attempt to clean out the chiminea immediately after use as the chiminea and the fuel will be extremely hot and can cause injury. If you HAVE to leave the chiminea unattended then it shouldn't cause any damage if the correct setup procedure has been followed, do not leave any flammable substances surrounding the chiminea, if necessary, wet the surrounding area. I have rattan furniture. Can I still have a chiminea? Rattan furniture comes in two forms, natural wicker and resin wicker. Do not place the chiminea too close to either, the heat emitted from the chiminea once lit can cause resin wicker to expand and sag, or even melt. It is also a fire hazard to have natural wicker too close to the lit chiminea. We understand that you want to sit on your rattan furniture and feel the benefits of your chiminea, this is absolutely fine, just make sure that you don't place the chiminea too close. Can I use my chiminea on my wooden decking? Yes, you can. We recommend that you place a paving slab or similar underneath the chiminea and the surrounding area. The heat generated by the burning fuel can burn your wooden decking, burning fuel can also fall out of the chiminea if it is not designed with a door or the door is left open for refueling for example. Layering the surrounding area with bricks or paving slabs will offer extra protection. What are the differences between using chiminea heat logs and using ordinary wood? There are two main differences between using chiminea heat logs and ordinary wood. The first difference is the amount of smoke produced. The second main difference is the amount of heat given off when burnt. Ordinary wood will give off a lot more smoke than chiminea fuel. Chiminea heat logs are specifically engineered to emit minimal smoke but produce a lot of heat for a sustained period of time. Here at White Stores we sell two different fuel types. One is what is known as an Easylog which burns for 2-3 hours, you simply light either end of the paper bag it is supplied in and leave to burn. The other product that we recommend are heat logs, The length of time that they burn for all depend on how many logs you use. The great thing about heat logs is that you can add more at anytime to increase the burning time. Is my chiminea safe to use around children and/or pets? When using a chiminea with children and/or pets around, we recommend full supervision and the placement of an additional chiminea guard, the guard is designed to stay cool and acts as a safeguard to put you at ease when having a real fire burning with children and/or pets in close proximity. Never leave your chiminea unattended when lit and after it has burnt out whilst it is cooling. The exterior will remain hot for a number of hours after the fire has burnt out.